In the last few years, we have seen a resurgence of interest in linen. From clothing to home textiles it has reappeared. There are many reasons for this. It is a green material and lends itself to a natural look. It is durable. 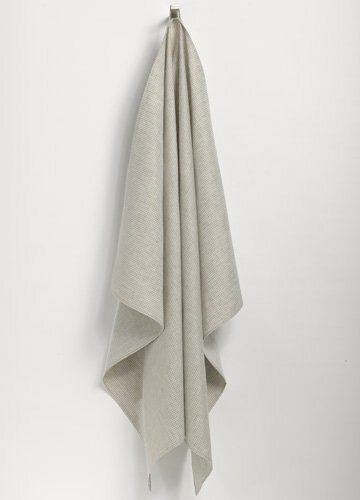 The next turn for linen has arrived, and that is the re emergence of the linen towel. Linen has long been used as bath towels. In Europe, flat woven linen towels are not uncommon today and, in fact, are the norm in many countries such as Italy and Eastern European countries like Lithuania. They are also the original towel. As in most old forms of textiles, there is reason people used them long ago: they worked and they lasted forever. This couldn’t be any truer of our ANICHINI linen towels. I also grew up with linen towels, which makes me an advocate for many reasons. I know first hand the longevity of these towels. Whenever I go home to Vermont, I use the same linen towels that my mother dried me off with when I was a baby. It still amazes me that they look the way they did when we bought them: elegant, clean, and luxuriously timeless. I know how they feel and I know how cotton terry towels feel and the level of clean and calm I get from using a linen towel can’t be beat. And I am not the only one who says this. All friends and family that stay at my home all want linen towels when they leave. I realize that most Americans have a hard time letting go of what they are used to: fluffy cotton terry towels. People are concerned that the linen won’t be as soft. Linen, being a natural fiber, will get softer as time goes on. But I think what people mean is they are going to miss the plushy terry. They think that linen won’t be absorbent. This is false. Have you ever tried to dry off a piece of china or stemware with a terry wash cloth? Try it. You will notice that the water just swirls around. Essentially, that is what you are doing to your body. Of course, the cotton terry towel will absorb a lot of moisture, but it also leaves a lot of water to evaporate on the skin, which can cause dry skin. Linen, on the other hand invigorates the skin, circulating blood flow and giving your skin a more healthy appearance. Linen is a natural exfoliant. In addition, terry has a very difficult time drying once it is wet. Linen towels are naturally antimicrobial so they don’t become “sour” like terry can (especially in the summer with humidity). They are classic and modern at the same time. They speak to all ages and all times. And they are a green product. Terry takes a long time to dry not only after you use it but also after you wash it. You also can only fit about 4 terry bath sheets in a washing machine at a time. You can more than double that load with linen bath sheets. On top of that, you must dry terry on medium to high heat, which eats up energy. Linen can be air dried or tumbled shortly to dry and they look fantastic.